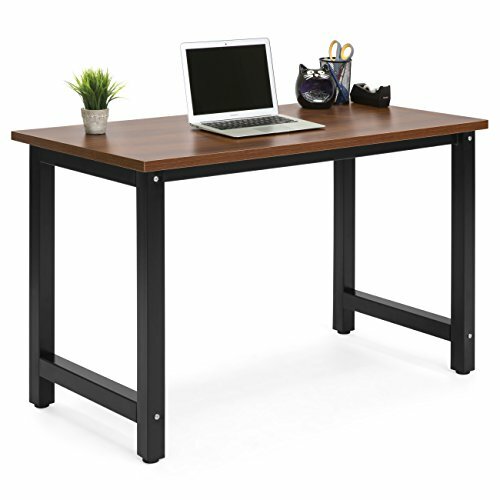 Best Choice Products Large Modern Computer Table Writing Desk Workstation for Home and Offce - Brown/Black by Best Choice Products at Community Frontiers. MPN: SKY4372. Hurry! Limited time offer. Offer valid only while supplies last. For an open workspace that promotes clear thinking and productivity, this desk provides just that with a clean, modern aesthetic and spacious design. For an open workspace that promotes clear thinking and productivity, this desk provides just that with a clean, modern aesthetic and spacious design. Work freely and comfortably with a broad surface that can easily fit any belongings. When you need to focus on writing an article or studying for an exam, this desk will be there for you. Overall Dimensions: 47.25"(L) x 23.5"(W) x 29.25"(H); Weight Capacity: 100 lbs.